Nathaniel snapped the black-and-whites that form the composite image a decade ago on and of Black Mountain for an annual photography contest in Cave Creek. His winning submission was pivot of four photos. Three share a mountainous silhouette, cloud wisps and a monkey-armed tree. “See how the cactus grows diagonally there?” asks Benjamin Kastelic, Nathaniel’s older brother, motioning to the fourth 4-by-6 – a mountainside saguaro brokers the curious ouroboros. The 27-year-old and 30-year-old Kastelic siblings, both teachers at Acorn Montessori School, sit across the table from each other in their angular cabin west of Prescott, near Iron Springs. “They were supposed to put the winners on postcards,” Ben says. “But how would you do that with this?” Nathaniel finishes, further describing how a trigger-happy photo session lead to the piece. Nathaniel continued experimenting with the imaging technique, and more punctuated equilibrium followed. Boom: There’re his symmetrically inflected nature photos. Boom: There’re his time-lapse videos of photo montages assembled in nature. Boom: There’re the silk dress and skirt prototypes for 11th Loop, a new line of clothes developed by the brothers Kastelic. Plenty of people come to Codi Bounds with clothing ideas. 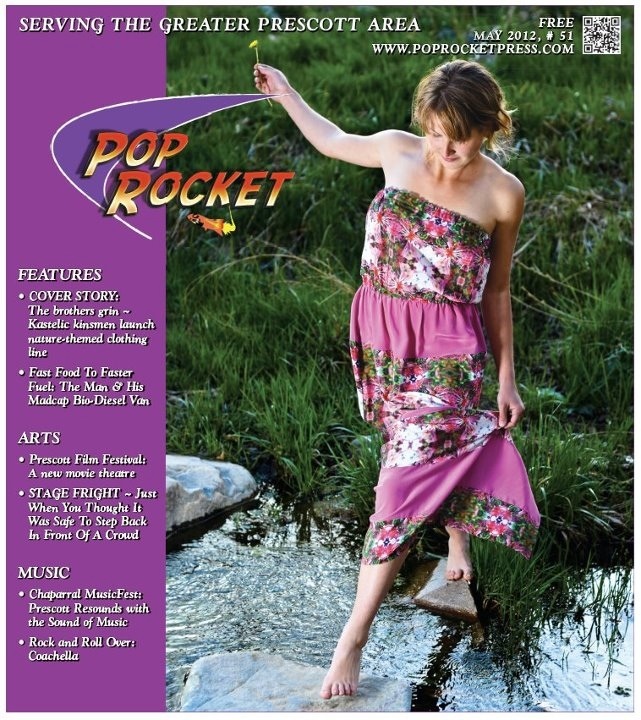 “I’ve done a lot of wedding dresses, bridesmaid, prom and formal dresses, many of them from pictures and patterns,” says Bounds, of Prescott, who has sewn projects for about 15 years. Nathaniel and Ben’s idea to launch a clothing line featuring repeating nature patterns, though, is novel. “I think it’s cool. They have a different perspective on women’s clothing than I do, and their excitement is, well, yeah, really exciting,” Bounds says. A sundress, a miniskirt, a full dress, a skirt and a blouse – these silken prototypes, each with its own pattern, synthesize designs nursed by botanical evolution, artwork and abstraction. The first one came together in March. The rest should be done by June. At first glance, the patterns are vibrant bursts of psychedelia. The double take: they’re mesmerizing fractals that spiral in on themselves. The third time, they’re kaleidoscopes of symmetry. Fourth, and furthermore, they’re all three. It’s a shock to hear there’s little photo manipulation at play. Nathaniel and Ben point out swaths of solid pink in a dress design they’d originally dismissed as well as the slanted pattern on a skirt they’d never anticipated. 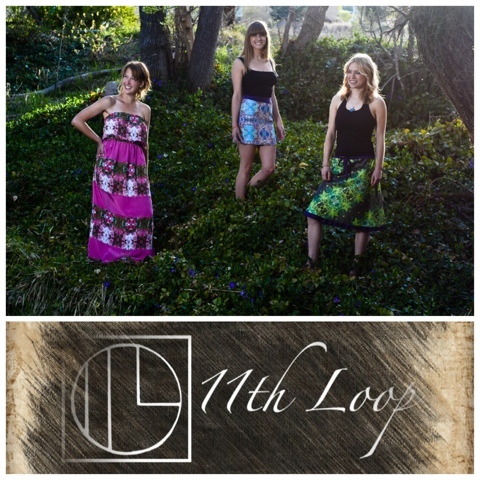 If all goes well, 11th Loop clothing could be on sale in Prescott boutiques or online at http://www.11thloop.com next year. The Kastelic brothers founded the label in November, specifically 11/11/11, and they’re excited to move forward, although the new media and medium have raised fundamental questions. “At one point we had to ask ourselves, ‘Are we fashion designers? Is that what we’re trying to do? '” says Ben, who’s in charge of the 11th Loop’s Internet presence. “That’s what I’m saying. We’re not trying to be fashion designers, necessarily, but here we are.” Nathaniel says. As the April sun sets over the Prescott National Forest casting long shadows through the family cabin’s picture windows the brothers wax esoteric. One wall is decorated with cutouts from Vogue magazines and Nathaniel’s designs. The opposite wall is dominated by a whiteboard webbed with ideas. As Nathaniel and Ben discuss their love of nature, outdoor sports, the fine arts, and their newfound interest in fashion, the subject of sibling rivalry simmers. It turns out this is the first time they’ve worked together on an artistic project for which Nathaniel has taken the lead. “I’ve always thought of myself supporting him, as blazing the trail,” says Ben, who often finishes his brother’s sentences. He tells a story about a drawing contest they had as children. They drew airplanes and pushed their dad to pick a favorite. (“No, they’re not both outstanding; one of them is the best; you have to pick one.”) It was Nathaniel’s because he put a pilot in the cockpit. Competition, it seems, sparks the fire of creativity, but it takes cooperation to foster a creative pyre.